Decided to go organic last night. Hollow big hole bead that I added etched copper bead caps and cored with sterling silver tubing. The bead is made out of ivory with silvered ivory shards melted in and fumed with silver. Thin lines of black and dots of turquoise and black embellish the bead. The big bead is hollow except made on a smaller mandrel. 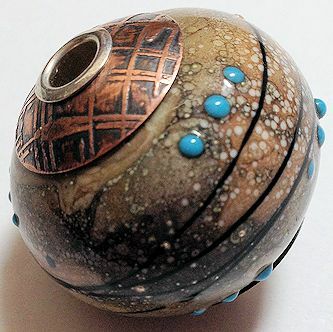 Various surface decorations on the smaller round beads and two silver glass spacers.